This machine is our UV Hybrid Printer. Its printing width is 3.2m. With the extension tables at the back and front, it can print unlimited length for the Rigid materials. 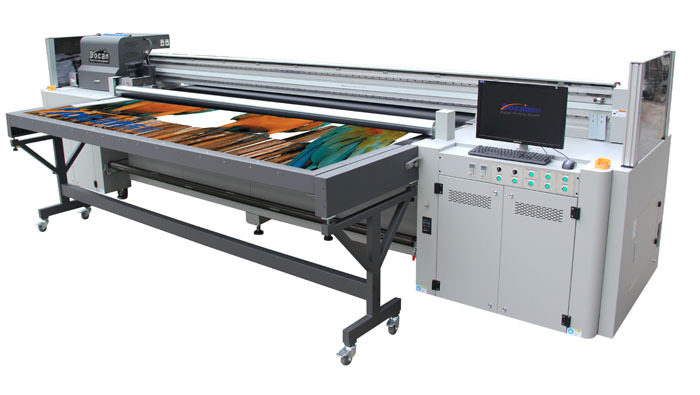 Using the UV ink it can print excellent images on various rigid medias, such as glass, acrylic, wood, PVC foam board, KT board, MDF, alunimum, cellphone case, ceramic tiles, and flexbile materials like banners, vinyl, mesh, and so on. . Also, it offers various ways of printing the white color. It can print the three-layer spot colors which means it can print color-white-color at one time! The printheads can be KM-512MH-14PL, KM-1024MHB-14PL, KM-1024iMEH-13PL or Ricoh Gen5 7PL. The printing colors can be Lc Lm Y M C K, and White is optional! ★The white ink catridge is with the automatic stiring and circulation system, which avoids the clog of the White printhead.